The new Pershing 108 will have three 2,435hp MTU diesel engines connected to Arneson surface drives. SEE MBY’S GALLERY OF THE PERSHING 108. This is the first ever Pershing to be fitted with three of Arneson’s surface piercing drive systems. 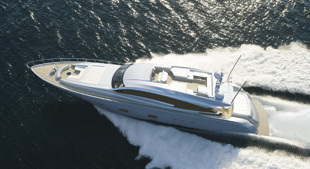 Pershing say that with all three MTUs at full chat the 108 will hit 42 knots. Pershing are also quick to highlight the versatility that having three drives can afford the skipper. The 108 will happily cruise at 25 knots with just the two outer drives working and by the same token she can run at 10 knots with just the middle drive engaged. On deck the main socialising areas are split between the cockpit, flybridge and a seating area on the bow. The cockpit has plenty of room for a dining table to be drawn up to the large transom bench which is joined to the aft sunpad. 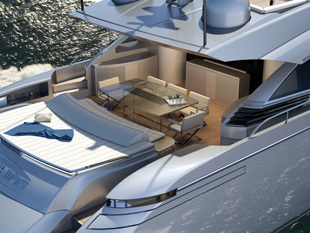 The flybridge has seating areas and sunpads in equal measure as well as a dumb waiter which allows food and drink to be passed up from the galley below. 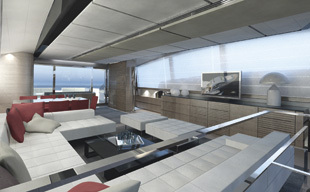 The bow area, ideal for privacy when moored stern to, has a sunpad underneath which there is room for two jet skis. There is also room for a jet ski and a small RIB in the tender garage aft. On the inside the partition between the cockpit and saloon drops away at the flick of a switch to transform both areas in to one enormous living area. 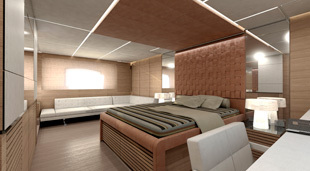 The lower deck has four ensuite guest cabins and three ensuite crew cabins between the master ensuite and the engineroom. The master cabin can be specified with either a dressing area or a study depending on the owner’s wishes.